It's time once again for our quarterly review of the earnings calls of leading freight carriers for Q1, 2012, srarting first this wee for truckload carriers, followed next week by a look at the LTL and rail sectors. Heartland Express noted that continuing challenge with recruiting drivers, and that "This is the biggest challenge facing our industry." As usual, we provide both key financial results for the leading public truckload carriers, and summarize comments from the carriers on press releases and earnings calls to provide what is usually some interesting insight for shippers to better understand what is happening in the industry. In general, Q1 was another good one for truckload carriers, with revenues up somewhere between 5.6% and 17.7%, depending on the carrier, with the average 11.7% including fuel surcharges for our seven featured carriers, as seen in the table below. Fuel surcharges were said to be up in the 3-4% range, depending on the carrier, but even subtracting that out, the top line improved nicely for most of the carriers, though the growth seems to have slowed a bit from the pace in Q3 and Q4 of 2011. JB Hunt saw is VAS business growth by 12.7% and its intermodal machine growth strongly again, up 20.3% in the quarter, versus straight truckload growth of just 7.6%, not much after subtracting the growth in fuel surcharges. Werner saw its single number for all VAS rise 20.7% in Q1, versus TL growth of just 3.7%. Other carriers may have picked up some share from those more diversified carriers. Knight Transportation, which is still dominated by straight truckload carriage, saw its revenues rise by a strong 17.7%. Swift saw a 9% increase in revenue. The picture was even brighter on the bottom line, with profits from almost all carriers up nicely. That was led by Swift and Celadon, which saw profits rise 93% and 149% in Q1 year over year. Werner, Hunt and Marten all saw net income rise by at least 30%. Below, we summarize key comments from each company associated with their Q1 releases, though we will again note that the depth in these comments varies significantly by carrier, so if we don't have much, that probably means they didn't say much. Q1 represented the ninth consecutive quarter in which Werner attained year-over-year earnings growth in excess of 20%. Freight trends in first quarter 2012 were more steady and balanced throughout the U.S. geographic network compared to first quarter 2011. Average revenues per total mile, net of fuel surcharge, increased 2.6% in first quarter 2012 compared to first quarter 2011. However, average revenues per total mile declined 1.8% sequentially, when comparing first quarter 2012 to fourth quarter 2011. The company said that "We operated slightly below our fleet goal of 7,300 trucks due to the more challenging driver market, and we ended 2011 with 7,200 trucks. Our entire team worked closely together to increase our truck count to the 7,300 level, and we achieved this during the final week of first quarter 2012. We intend to maintain our fleet size at approximately this level. Our primary objectives continue to be expanding our operating margin percentage and improving our returns on assets, equity and invested capital, while staying true to our broad transportation services portfolio." It noted that industry fleet growth is occurring, as some carriers are already struggling to finance the replacement truck upgrade due to the large pricing gap between the significantly increased costs of EPA-compliant new trucks compared to the lower value of record-old trucks. It says that for a newer fleet, the average cost of the new trucks purchased in first quarter 2012 was approximately 30% higher than the original purchase price of used trucks sold in first quarter 2012. Hunt's intermodal operating ratio was 88.5%, much higher than the 96% OR for its truckload segment, as intermodal continues to drive the profit stream there. It saw intermodal growth of 28% in its Eastern network, 9% in the rest of the country. That was mostly driven by pure volume, as rates were up just 3%. "We continue to operate under our long stated strategy of directing investments towards solutions that customers need and are willing to pay for with reasonable rates and structured contract terms," said CEO John Roberts. Hunt also said that its rate per loaded mile, excluding fuel surcharges, increased 2.1% over the same period last year but was unfavorably impacted by weaker spot pricing and fewer paid empty miles. Rates from consistent shippers improved year-over-year by 2.6%. At the end of the current quarter, Hunt had a tractor count of 2,561 compared to 2,497 in 2011 due to an increase in the use of independent contractors. Though still a relatively small part of its business, Swift saw intermodal growth of more than 44% in Q1. Swift in general is also keeping its fleet size flat, even dropping it about 4% in Q1 to temporarily react to a seasonal reduction in demand (see graphic below). Revenue per tractor (excluding fuel surcharge) improved 10.3% as a result of a 7.3% improvement in miles per tractor and a 2.8% improvement in revenue per total mile (excluding fuel surcharge) with a 2.6% longer length of haul. Company said non-asset based brokerage and intermodal businesses also continued to see double-digit revenue growth and are becoming a more meaningful percentage of its total revenue. Knight veered from the trend a bit by increasing its tractor count 45 in Q1, to 4032. The company's average fleet age is only 1.7 years. Company says it "continue to focus on fuel economy and efficiency through the management of idle hours, investment in fuel efficient new tractors, trailer skirts, fuel surcharge billings, and strategic fuel purchasing decisions," and that "These efforts are at the forefront of our daily activities." Heartland also says that the competition for good drivers continues to intensify as the economy improves and increased industry regulation causes the driver market to tighten, saying that "This is the biggest challenge facing our industry." Company says that it will "focus on building a multi-faceted business model and attention to developing a diverse customer base have expanded our logistics business and our regional operations throughout the country." 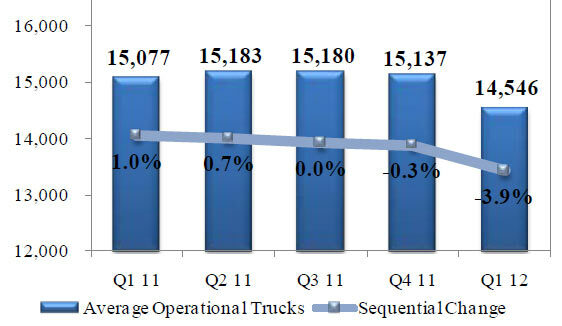 It increased its regional operations to 67.8% of its truckload fleet as of March 31, 2012, from 57.1% a year earlier. Marten's regional operations contributed to a 4.5% increase in average truckload revenue, net of fuel surcharges, per tractor per week, over Q1 2011. That's it for our truckload Q1 review. We will be back next week with LTL and rail carrier results and comments. Any reaction to our Q1 truckload review? Let us know your thoughts at the Feedback section below.